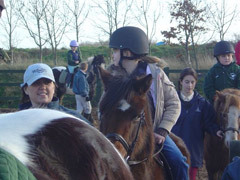 Qualified and competent riding instructors provide a series of riding lessons for children and adults, from novice to very experienced riders who want the challenge of learning something new. 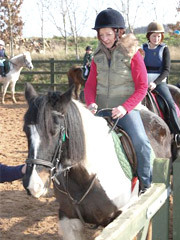 Many clients want to learn to take part in our riding lessons so that they can trek out safely, others wish to improve their lateral work ans some want to take jumping lessons. 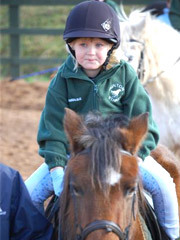 Children from the age of 4 years are insured to ride at Dunton Stables. 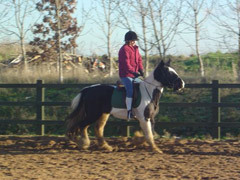 For very young, new riders there is a 30 minute session where they will learn the basics on a lead rein pony, before progressing onto a full 45 minute lesson. All riders are assessed and guided towards the most appropriate riding lesson for their ability and for what they want to achieve. Group riding lessons involve no more than 6 riders. This helps to ensure that each individual receives the attention needed from the instructor. 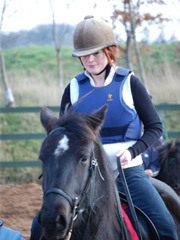 Private riding lessons are also available. 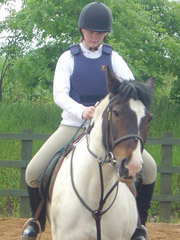 All riders are provided with hard hats and body protectors. 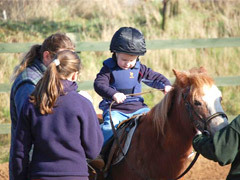 Safe, enjoyable and fun riding experiences are enjoyed by people of all ages. Spectators and riders are offered Tea and coffee, free of charge. Riders are also given a cold drink after their lesson - to help them to cool down after their hard work! For those who are interested in the care and welfare of the horses and ponies, customised stable management sessions are readily available.